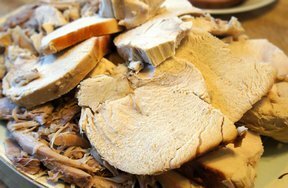 A super easy way to cook a moist and delicious turkey. In an oven bag the turkey cooks in less time and comes out juicy and full of flavor. Perfect for your Thanksgiving dinner with family and friends. Preheat oven to 350 degrees. Shake flour in Reynolds Oven Bag; place in roasting pan at least 2" deep. Add vegetables to oven bag. Remove neck and giblets from turkey. Rinse turkey; pat dry. Lightly stuff with your favorite stuffing recipe, if desired. Brush turkey with oil. Place turkey in Oven Bag on top of vegetables. Close oven bag with nylon tie; cut six 1/2" slits in top. Insert meat thermometer through oven bag into thickest part of inner thigh, not touching bone. Bake 2 to 2 1/2 hours for a 12 to 16 lb. turkey, 2 1/2 to 3 hours for a 16 to 20 lb. turkey, and 3 to 3 1/2 hours for a 20 to 24 lb. 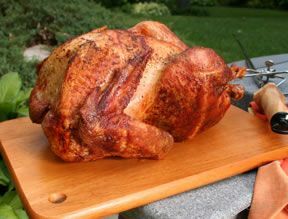 turkey or until meat thermometer reads 180 degrees. Add 1/2 hour for stuffed turkey. Let stand in oven bag 15 minutes. If turkey sticks to oven bag, gently loosen bag from turkey before opening oven bag. "Is there any advantage to putting the breast down vs up?" 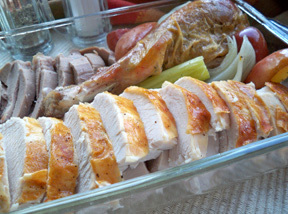 "Super easy recipe and super moist turkey. I roasted a 20 lb. turkey using this recipe. It turned out moist and delicious but my 20 lb. turkey only took 2 1/4 hours to cook and I only had the oven on 325 degrees. The meat was nice and moist, and the skin was nicely browned, which I was a little surprised because I didn't expect it to be since it was cooked in a bag. I am just glad I checked the temperature of the turkey when I did. Otherwise I am afraid the turkey would have gotten pretty dry. 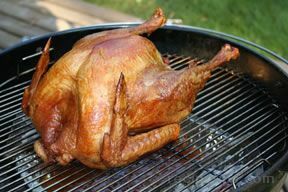 So check the temperature of your turkey way before the suggested cooking time."